Medifast Variety Packages for Women are an easy, economical way for you to order our most popular Medifast Meals. They contain the exact number of Medifast Meals for you to use in your 5 & 1 Plan. The 2 week medi fast food package contains a total of 70 Medifast Meals and the 4 week package is enough for 28 days with a total of 143 medifast diet meals. Medifast For Men Variety Packages are an easy, economical way for you to order our most popular Medifast Meals. Specially Formulated for men, The 2 week package contains a total of 70 complete Medifast Meals and the 4 week medifast food package is enough for 28 days of 5&1 meals with a total of 143 medifast diet meals. Medifast for Men 4 week package special. Medifast Variety Packages for Diabetics are specially formulated to meet the needs of type 2 diabetics and are an easy and affordable way to order Medifast Meal packages. The 2 week package contains a total of 70 complete Medifast Meals and the 4 week package is enough for 28 days with a total of 143 medifast diet meals. Each package has the exact number of Medifast Meals for you to use in your Diabetic 5 & 1 Plan. Each Medifast Plus for Joint Health shake helps to increase elasticity and range of motion and prevents premature degeneration of cartilage while helping to maintain healthy joints. Each Box of Medifast Shakes for Joint Health contains 7 Servings per box. Each Medifast Plus for Appetite Suppression shake contains the same great ingredients as the original Medifast shakes, but with the added benefits of CitriMax®, which is designed to curb appetite while maintaining consistent weight loss Each Box of Medifast Shakes for appetite suppression contains 7 Servings per box. Medifast Plus for Women's Health is formulated to help a woman's body naturally adjust to the changes associated with menopause through nutrition and weight management. Each Box of Medifast Plus Shakes for Women's Health contains 7 Servings per box. A Medifast Plus for Coronary Health Shake provides a natural defense against heart conditions brought about by improper diets. Each Box of Medifast Plus Shakes for Coronary Health contains 7 Servings per box. Medifast Bars are a long-time favorite of our customers. Medifast Bars are perfect for a late morning or early afternoon meal. These nutritious bars give you the variety and convenience that your lifestyle demands, with the nutritional excellence that your body needs. Flavors available: Caramel nut, Fruit & Nut Granola, Lemon Yogurt, Chocolate, Chocolate Granola, Oatmeal Raisin, Peanut Butter, S'mores Granola Each box of Medifast meal replacement snack bars contains 7 bars. The Medifast Design a Menu plan allows you to pick the meals and shakes you like. 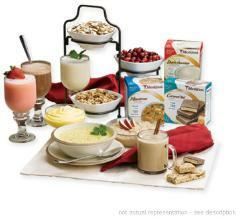 Select from Medifast55 Shakes, Meal replacement bars and medifast foods meals. Get Started Now and Pick your own Medifast Meal plan here!